A more effective noise reduction method is provided. In the method, when mass spectrum information having a spatial distribution is processed, the whole data is taken as three-dimensional data (positional information is stored in an xy plane, and spectral information is stored along a z-axis direction), and three-dimensional wavelet noise reduction is performed by applying preferable basis functions to a spectral direction and a peak distribution direction (in-plane direction). particularly to noise reduction thereof. expression of the protein in the living organism is significantly small. Further, since an amplification method used in the genome analysis cannot be used in the proteome analysis, a detection system in the proteome analysis is effectively limited to a high- sensitivity type of mass spectrometry. spectrometry, it is typical that MALDI is used as an ionization method and a TOF mass spectrometer is used as a mass spectrometer. In another method for performing the proteome analysis, MS/MS measurement is performed on each peptide by using ESI as an ionization method and an ion trap mass spectrometer as a mass spectrometer, and consequently the resultant product ion list may be used in a search process. In the search process, a proteome analysis search engine MASCOT® developed by Matrix Science Ltd. or any other suitable software is used. In the method described above, although the amount of information is larger and more complicated than that in a typical PMF method, the attribution of a continuous amino acid sequence can also be identified, whereby more precise protein identification can be performed than in a typical PMF method. monitoring (MRM) for quantifying a specific peptide contained in a peptide fragment compound. (estrogen receptor expressed in a hormone dependent tumor) , which is a reference used to judge whether hormone treatment should be given, and HER2 (membrane protein seen in a progressive malignant cancer) , which is a reference used to judge whether Herceptin should be administered. Immunostaining method, however, involves problems of poor reproducibility resulting from antibody-related instability and difficulty in controlling the efficiency of an antigen-antibody reaction. Further, when demands for such functional diagnoses grow in the future, and, for example, more than several hundreds of types of protein need to be detected, the current immunostaining method cannot meet the requirement. heterologous transplantation into an immune-deficient mouse, forms a tumor, for example, it has been gradually understood that the growth of a tumor tissue depends on the differentiation and self-regenerating ability of a tumor stem cell. In a study of this type, it is necessary to observe the distribution of an expressed specific antigen in individual cells in a tissue instead of the distribution in the entire tissue. secondary ion mass spectrometry (SIMS) represented by time-of-flight secondary ion mass spectrometry (TOF- SIMS) . In this SIMS-based measurement, two-dimensional, high spatial resolution mass spectrometry information can be obtained. Also, the distribution of each peak in a mass spectrum is readily identified. As a result, the protein corresponding to the spatial distribution of the mass spectrum is identified in a more reliable manner in a shorter period than in related art. The entire data is therefore in some cases taken as three- dimensional data (positional information is stored in the xy plane, and spectral information corresponding to each position is stored along the z-axis direction) for subsequent data processing. SIMS is a method for producing a mass spectrum at each spatial point by irradiating a sample with a primary ion beam and detecting secondary ions emitted from the sample. For example, in TOF-SIMS, a mass spectrum at each spatial point can be produced based on the fact that the time of flight of each secondary ion depends on the mass M and the amount of charge of the ion. However, since ion detection is a discrete process, and when the number of detected ions is not large, the influence of noise is not negligible. Noise reduction is therefore performed by using a variety of methods. Among a variety of noise reduction methods, PTL 1 proposes a method for effectively performing noise reduction by using wavelet analysis to analyze two or more two-dimensional images and correlating the images with each other. Another noise reduction method is proposed in NPL 1, in which two-dimensional wavelet analysis is performed on SIMS images in consideration of a stochastic process (Gauss or Poisson process) . Noise reduction of related art using wavelet analysis has been performed on one-dimensional, time-course data or two-dimensional, in-plane data. On the other hand, when SIMS-based mass spectrometry is performed at a cell level, for example, information on the position of each spatial point and information on mass spectrum corresponding to the position of the point are obtained.. To perform noise reduction using two-dimensional wavelet analysis on data obtained by using SIMS, it is therefore necessary to separately perform wavelet analysis on not only the positional information having continuous characteristics but also the mass spectrum having discrete characteristics. In related art, such data has been processed in a single operation by taking the data as three-dimensional data (positional information is stored in the xy plane, and spectral information is stored along the z-axis direction) , but no noise reduction has been performed by directly applying wavelet analysis to the three- dimensional data. [ 0017 ] Further, in related art, even when noise reduction using wavelet analysis is performed on two-dimensional in-plane data obtained by using SIMS, the same basis function is used for each axial direction. It is, however, expected that a mass spectrum at each spatial point shows a discrete distribution having multiple peaks, whereas the spatial distribution of each peak (as a whole, corresponding to a spatial distribution of, e.g. insulin or any other substance) is continuous to some extent. It is not therefore typically desirable to perform noise reduction using wavelet analysis on the data described above by using the same basis function in all directions. An object of the present invention is to provide a method for performing noise reduction by directly applying wavelet analysis to the three-dimensional dat described above. Another object of the present invention is to provide a more effective noise reduction method in which preferable basis functions are used in a spectral direction and a peak distribution direction (in-plane direction) . To achieve the objects described above, a method for reducing noise in a two-dimensionally imaged mass spectrum according to the present invention is a method for reducing noise in a two-dimensionally imaged mass spectrum obtained by measuring a mass spectrum at each point in an xy plane of a sample having a composition distribution in the xy plane. The method includes storing mass spectrum data along a z-axis direction at each point in the xy plane to generate three- dimensional data and performing noise reduction using three-dimensional wavelet analysis. measuring a mass spectrum at each point in an xy plane of a sample having a composition distribution in the xy plane, and the mass spectrometer stores mass spectrum data along a z-axis direction at each point in the xy plane to generate three-dimensional data and performs noise reduction using three-dimensional wavelet analysis . corresponding to the spatial distribution of the mass spectrum can be identified more reliably and quickly than in related art. Further features of the present invention will become apparent from the following description of exemplary embodiments with reference to the attached drawings. Brief Description of Drawings [Fig. lA]Fig. 1A is a diagram of a three-dimensional signal generated from measured mass spectrum signals. [Fig. IB] Fig. IB is a diagram of a three-dimensional signal generated from measured reference signals. [Fig. 2A]Fig. 2A is a diagram illustrating how multi- resolution analysis is performed in wavelet analysis of the three-dimensional signal generated from measured mass spectrum signals. [Fig. 2B]Fig. 2B is a diagram illustrating how multi- resolution analysis is performed in wavelet analysis of the three-dimensional signal generated from measured reference signals. [Figs. 3A, 3B, 3C, 3D] Figs. 3A, 3B, 3C, and 3D are diagrams illustrating how the wavelet analysis of the three-dimensional signal generated from measured mass spectrum signals is performed along each direction. [Fig. 4] Fig. 4 is a diagram illustrating the order of directions along which three-dimensional wavelet analysis is performed. [Figs. 5A, 5B]Figs. 5A and 5B are diagrams illustrating that a threshold used in noise reduction is determined based on the value of a signal component at each scale that is acquired by applying wavelet analysis to a reference signal. [Figs. 6A, 6B]Figs. 6A and 6B are diagrams illustrating that a mass signal with noise removed is generated by replacing signal components having wavelet coefficients having absolute values smaller than or equal to a threshold having been set with zero and performing wavelet reverse transform. [Fig. 7A]Fig. 7A is a diagram of a sample used to simulate a mass spectrum having a spatial distribution. [Fig. 7B]Fig. 7B illustrates the x-axis distribution of the sample illustrated in Fig. 7A. distribution of the sample illustrated in Fig. 7A. [Fig. 8A]Fig. 8A illustrates the distribution of sample data in the x-axis and z-axis directions. [Fig. 8B]Fig. 8B illustrates the distribution of the sample data to which noise is added in the x-axis and z-axis directions. [Fig. 9A]Fig. 9A illustrates the distribution of the sample data to which noise is added in the x-axis and z-axis directions. distribution of the data illustrated in Fig. 9A. [Fig. 10A]Fig. 10A illustrates an xz-axis distribution of the sample data to which noise is added illustrated in Fig. 8B. [Fig. 10B]Fig. 10B illustrates a result obtained by performing noise reduction using a Harr basis function on the sample data illustrated in Fig. 10A in the x- axis and z-axis directions. [Fig. llAJFig. 11A illustrates an xz-axis distribution of the sample data to which noise is added illustrated in Fig. 8B. [Fig. llB]Fig. 11B illustrates a result obtained by performing noise reduction using a Coiflet basis function on the sample data illustrated in Fig. 11A in the x-axis and z-axis directions. [Fig. 12A]Fig. 12A illustrates an xz-axis distribution of the sample data to which noise is added illustrated in Fig. 8B. [Fig. 12B]Fig. 12B illustrates a result obtained by performing noise reduction using a Haar basis function on the sample data illustrated in Fig. 12A in the x- axis direction and performing noise reduction using a Coiflet basis function on the sample data illustrated in Fig. 12A in the z-axis direction. [Fig. 13A]Fig. 13A is an enlarged view of part of the result illustrated in Fig. 10B. [Fig. 13B]Fig. 13B is an enlarged view of part of the result illustrated in Fig. 11B. [Fig. 13C]Fig. 13C is an enlarged view of part of the result illustrated in Fig. 12B. [Fig. 14] Fig. 14 is a flowchart used in the present invention . [Fig. 15] Fig. 15 is a diagram of a mass spectrometer to which the present invention is applied. fragment before three-dimensional wavelet processing. [Fig. 16B]Fig. 16B illustrates the distribution of the peak in the mass spectrum corresponding to the HER2 fragment after three-dimensional wavelet processing. [Fig. 17] Fig. 17 is a micrograph of a sample containing HER2 protein having undergone immunostaining method obtained under an optical microscope and illustrates the staining intensity in white. [Fig. 18A]Fig. 18A illustrates the distribution of a mass spectrum at a single point in Fig. 16A before noise reduction. [Fig. 18B]Fig. 18B illustrates the distribution of the mass spectrum at the same point in Fig. 18A after noise reduction . [Fig. 19] Fig. 19 illustrates how well background noise is reduced. [Fig. 20] Fig. 20 is a graph illustrating the amount of change in a mass signal before and after the noise reduction versus the threshold. corresponding to information on the positions of points in the xy plane is called a two-dimensionally imaged mass spectrum. containing no mass signal is acquired at each spatial point, and the background signal is used as a reference signal to set a threshold used in noise reduction. The threshold is not necessarily determined by acquiring a background signal but may alternatively be set based on the variance or standard deviation of a mass signal itself . present invention. The following description will be made in the order illustrated in the flowchart with reference to the drawings. In step 141 illustrated in Fig. 14, mass spectrum data is measured at each spatial point by using TOF-SIMS or any other method. In step 142 illustrated in Fig. 14, the measured data is used to generate three-dimensional data containing positional information in a two- dimensional plane where signal measurement has been made and a mass spectrum at each point in the two- dimensional plane. corresponds to a two-dimensional plane (xy plane) where signal measurement is made, and the z axis corresponds to a mass spectrum at each point in the xy plane. In other words, (x, y) stores in-plane coordinates where signal measurement is made, and z stores a mass signal count corresponding to m/z . generated from a background signal measured at each of the spatial points and containing no mass signal. When each point in the three-dimensional space is expressed in the form of (x, y, z) , (x, y) corresponds to a two- dimensional plane where signal measurement is made, and the z axis corresponds to a background spectrum. In other words, (x, y) stores in-plane coordinates where signal measurement is made, and z stores a background (reference) signal count. The reference signal can be used to set the threshold used in noise reduction.
] In steps 143 and 144 illustrated in Fig. 14, wavelet forward transform is performed on the generated three- dimensional data. [ 0035 ] Further, the wavelet transform can be expressed not only in the form of continuous wavelet transform described above but also in a discrete form. The wavelet transform expressed in a discrete form is called discrete wavelet transform. In the discrete wavelet transform, the sum of products between a scaling sequence pk and a scaling coefficient Sk3 1 is calculated to determine a scaling coefficient s3 at a one-step higher level (lower resolution) (Formula 3) . Similarly, the sum of products between a wavelet sequence qk and the scaling coefficient Sk3"1 is calculated to determine a wavelet coefficient w3 at a one-step higher level (Formula 4). 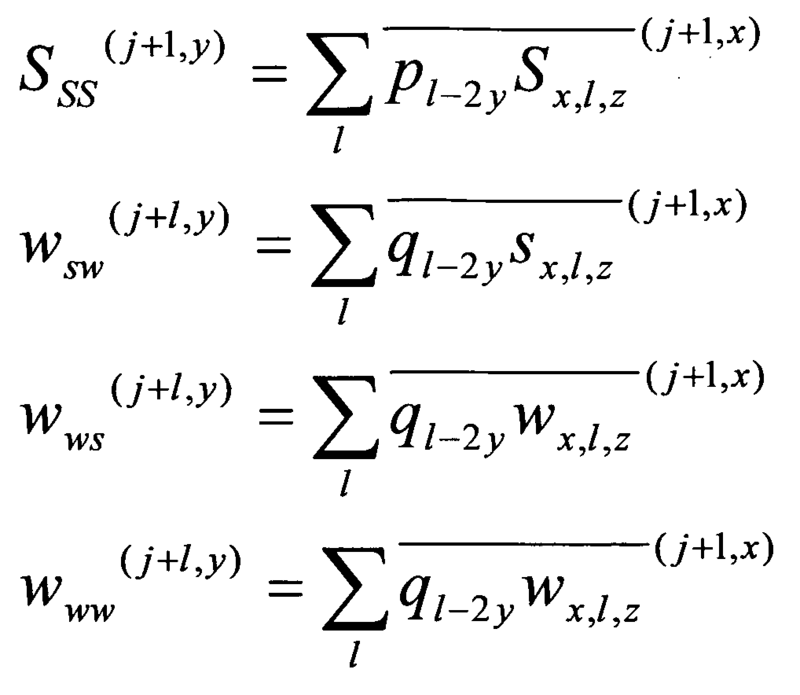 Since the Formulas 3 and 4 represent the relation between the scaling coefficients and the wavelet coefficients at the two levels j-1 and j , the relation is called a two-scale relation. Further, analysis using a scaling function and a wavelet function at multiple levels described above is called multi-resolution analysis. Fig. 2A illustrates a result obtained by performing the wavelet analysis on the three-dimensional mass signal generated in the previous step. Whenever the wavelet analysis is performed once, scaling coefficient data, in which each side of the data is halved, and wavelet coefficient data, which is the remaining portion, are generated. When the data is three-dimensional data and whenever the wavelet analysis is performed once, the number of signals to be processed is reduced by a factor of (2)3=8, whereby the analysis can be made at high speed. Fig. 2B illustrates a result obtained by performing the wavelet analysis on the three-dimensional reference signal generated in the previous step. The process is basically the same as that for the mass signals. Figs. 3A, 3B, 3C, and 3D illustrate results obtained by performing the wavelet analysis on the three- dimensional mass signal generated in the previous step along the x-axis, y-axis, and z-axis directions. coefficients at one-step higher levels are determined by performing x-direction transform (Formula 5) . coefficients at one-step higher levels are determined by performing z-direction transform (Formula 7) on the results of the y-direction transform. signal is used to determine the threshold used in the noise reduction, and any signal component having a wavelet coefficient whose absolute value is smaller than or equal to the threshold is replaced with zero. The threshold is not necessarily determined from the reference signal but may be set, for example, based on the standard deviation of the mass signal itself. Further, the method for setting the threshold is not limited to a specific one, but the threshold can be set by using any known method in noise reduction using the wavelet analysis. Figs. 5A and 5B diagrammatically illustrate how the threshold used in the noise reduction is determined by referring to the reference signal. Since the wavelet coefficients associated with noise are present at all levels, the magnitude of the absolute value of the wavelet coefficient at each level of the reference signal in Fig. 5B is used to set the threshold used in the noise reduction. Based on the thus set threshold, among the signal components illustrated in Fig. 5A, those having wavelet coefficients whose absolute values are smaller than or equal to the threshold are replaced with zero. It is noted that the signal components having been set at zero can be compressed and stored. coefficients smaller than or equal to the threshold with zero. 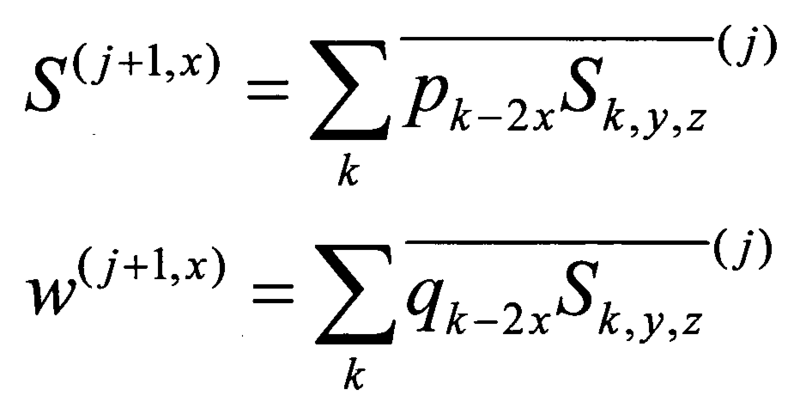 reduction may be estimated from the amount of change in the standard deviation of the signal, as described above. Since the effect on the noise reduction greatly changes before and after the threshold having a magnitude exactly allows the reference signal to be removed, the amount of change in the signal before and after the noise reduction increases when the threshold has the value described above. To determine an optimum threshold based on the amount of change in the signal before and after the noise reduction, for example, it is conceivable to monitor the change in the sign of a second derivative of the amount of change in the signal before and after the noise reduction with respect to the change in the threshold. Since the amount of change in the signal before and after the noise reduction increases in the vicinity of an optimum threshold, the sign of the second derivative of the amount of change will change from positive to negative and vice versa. An optimum threshold can therefore be determined based on the change in the sign. coefficients having absolute values smaller than or equal to the thus set threshold have been replaced with zero, in each axial direction by using the same basis functions used when the forward transform is performed but in the reverse order to the order when the forward transform is performed. Fig. 4 is a diagram illustrating that the order of the axes along which the three-dimensional wavelet reverse transform is performed is reversed to the order of the axes along which the three-dimensional wavelet forward transform is performed, and that the basis functions used along the respective axial directions are the same in the forward transform and the reverse transform. In the three-dimensional wavelet reverse transform, the original signal is restored by convolving between a basis function and wavelet transform (Formula 9) . discrete form, as in the case of the wavelet forward transform. 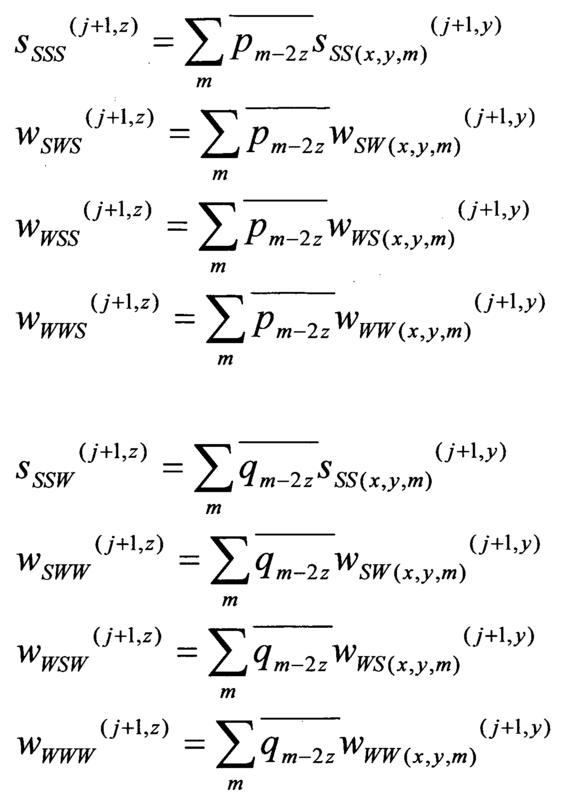 In this case, the sum of products between the scaling sequence pk and the scaling coefficient sk j and the sum of products between the wavelet sequence qk and the wavelet coefficient wk 3 are used to determine the scaling function sequence s3-1 at a one-step lower level (higher resolution) . Fig. 6B diagrammatically illustrates that noise in the original mass signal illustrated in Fig. 6A decreases after the signal components having wavelet coefficients having absolute values smaller than or equal to the threshold are replaced with zero as described above and then the wavelet reverse transform is performed. The present invention can also be implemented by using an apparatus that performs the specific embodiment described above. Fig. 15 illustrates the configuration of an overall apparatus to which the present invention is applied. The apparatus includes a sample 1, a signal detector 2, a signal processing device 3 that performs the processes described above on an acquired signal, and an imaging device 4 that displays a result of the signal processing on a screen. supplying software (computer program) that performs the specific embodiment described above to a system or an apparatus via a variety of networks or storage media and instructing a computer (or a CPU, an MPU, or any other similar device) in the system or the apparatus to read and execute the program. substrate 1 in an ink jet process, and the insulin 2 has a distribution having a diameter of approximately 30 um. preferably performed by using a Coiflet (N=2) basis function. In the present example, the noise reduction was performed as follows: The threshold was determined by substituting the standard deviation associated with each signal component into (Formula 11) and data smaller than or equal to the threshold was replaced with zero. In Formula 11, N represents the total number of data to be processed, and σ represents the standard deviation defined by the square root of the variance . Figs. 8A and 8B illustrate sample data used to simulate the system illustrated in Figs. 7A to 7C and are cross- sectional views taken along the x-z plane. Fig. 8A illustrates the distribution of an original signal, and Fig. 8B illustrates the distribution of the original signal to which noise is added. distributions in the x and z directions in Fig. 8B. Fig. 9A illustrates the sample data illustrated in Fig. 8B. Fig. 9B illustrates the signal distribution in the x-axis direction, and Fig. 9C illustrates the signal distribution in the z-axis direction. Fig. 10A illustrates the sample data illustrated in Fig. 8B, and Fig. 10B illustrates a result obtained by performing wavelet noise reduction using a Harr basis function on the sample data in the x-axis and z-axis directions. Fig. 11A illustrates the sample data illustrated in Fig. 8B, and Fig. 11B illustrates a result obtained by performing wavelet noise reduction using a Coiflet basis function on the sample data in the x-axis and z- axis directions. Fig. 12A illustrates the sample data illustrated in Fig. Figs. 13A, 13B, and 13G are enlarged views of portions of the noise reduction results illustrated in Figs. 10B, 11B, and 12B. Fig. 13A corresponds to an enlarged view of a portion of Fig. 10B. Fig. 13B corresponds to an enlarged view of a portion of Fig. 11B. Fig. 13C corresponds to an enlarged view of a portion of Fig. information. A distribution chart of the HER2 digestion fragment can thus be obtained. It is further possible to identify the distribution of the original HER2 protein from the information on the distribution of the digestion fragment. performed and the z axis corresponds to the mass spectrum. (manufactured by Pantomics, Inc.) and have undergone HER2 protein immunostaining method. In Fig. 17, portions having larger amounts of expression of the HER2 protein are displayed in brighter grayscales. It is noted that the sample having undergone the SIMS measurement and the sample having undergone the immunostaining method are not the same but are adjacent sections cut from the same diseased tissue (paraffin block) . enlarged and superimposed (the light line represents the spectrum before the noise reduction illustrated in Fig. 18A, and the thick, dark line represents the spectrum after the noise reduction illustrated in Fig. 18B) . As described above, since background noise is preferably removed by performing three-dimensional wavelet noise reduction on three-dimensional data in which (x, y) corresponds to a two-dimensional plane where signal measurement is performed and the z axis corresponds to a mass spectrum, the contrast ratio of the noise to the mass signal can be improved. Fig. 20 is a graph illustrating the standard deviation of a signal representing the difference before and after the noise reduction (that is, the magnitude of the removed signal component) versus the threshold (normalized by the standard deviation of the signal itself in Fig. 20) . Fig. 20 illustrates that the standard deviation of the signal representing the difference before and after the noise reduction greatly changes in a threshold range from 0.14 to 0.18, surrounded by the broken line, and that the noise reduction works well in the range and the vicinity thereof. modifications and equivalent structures and functions. This application claims the benefit of Japanese Patent Application No. 2010-025739, filed February 8, 2010, which is hereby incorporated by reference herein in its entirety. performing noise reduction using three-dimensional wavelet analysis. functions to each of the axes as those in the forward transform but reversing the order in which the basis functions are applied to the axes to the order in the forward transform. determining the threshold used in the noise reduction based on the magnitude of the absolute value of the wavelet coefficient at each level of the reference signal . temporarily setting a plurality of thresholds; and determining an optimum threshold used in the noise reduction based on the amount of change in mass signal before and after the noise reduction using each of the temporarily set thresholds. determining an optimum threshold based on the change in the sign of a second derivative of the amount of change in mass signal before and after the noise reduction with respect to the change in the threshold. wherein the mass spectrometer stores mass spectrum data along a z-axis direction at each point in the xy plane to generate three-dimensional data and performs noise reduction using three-dimensional wavelet analysis. threshold is removed, by applying the same basis functions to each of the axes as those in the forward transform but reversing the order in which the basis functions are applied to the axes to the order in the forward transform. wherein in the wavelet analysis, a basis function "that is symmetric with respect to its central axis and has a maximum at the central axis" is applied at least to the z-axis direction of the signal. wherein in the wavelet analysis, the threshold used in the noise reduction is determined based on a reference signal containing no mass signal. an optimum threshold used in the noise reduction is determined based on the amount of change in mass signal before and after the noise reduction using each of the temporarily set thresholds. wherein in the wavelet analysis, an optimum threshold is determined based on the change in the sign of a second derivative of the amount of change in mass signal before and after the noise reduction with respect to the change in the threshold. A computer program that instructs a computer to execute the method for reducing noise in a two-dimensionally imaged mass spectrum according to any one of claims 1 to 6.